Activate, change, and disable your access management settings at any time for your one-event branded app. The settings you configured when creating your app can be updated anytime. To make changes head to the Settings > Access Management section on your dashboard. Attendee List - you can limit the ability to register in the iPhone & Android apps and access their content to a specific list of attendees. After submitting your app you will be able to manage your attendee list via file upload, integration with Attendify Registrations, Eventbrite, Cvent, RegOnline, etouches and Google Forms. You can change the list anytime. For an extra layer of security, you will have an option to set up email verification - attendees will need to click on the verification link sent to their email address to confirm their identity. Enabling attendee list automatically locks access to the application's content for all unregistered users. Web App Password Protection - along with the mobile app you will lock access to your WebApp by setting up password protection. Note that you'll need to share the password with attendees in an external communication. 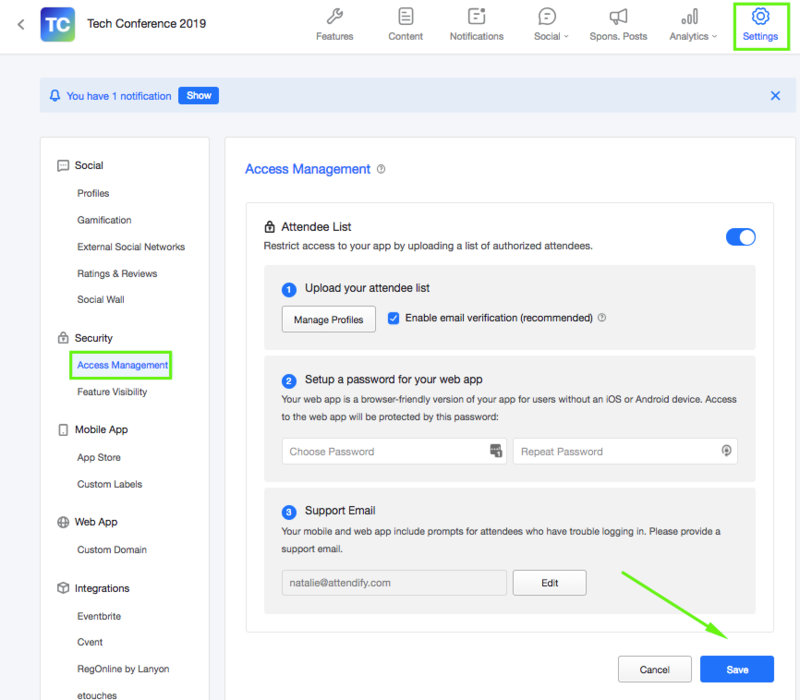 Support Email - when an attendee whose email hasn't been added to a list of profiles is trying to access the app he gets a prompt with an email of a person he can contact to help him gain access to the app. By default, this is the email associated with your Attendify account, but it can be changed at any time in the settings. If you have any additional questions, feel free to contact us at support@attendify.com or through the chat box that can be found at the bottom right cornet of any attendify.com page.